This carnitine liquid water enhancer is perfect for dieters looking to increase cellular metabolism and to improve performance. plus, it has zero sugar and zero calories! 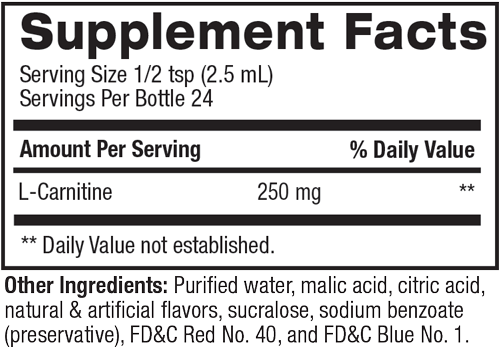 Carnitine liquid water enhancer is designed to make supplementing quick and easy. Just squeeze it in your water and go! Carnitine comes in two great flavors, Mixed Berry and Snow Cone, with zero added sugar and zero calories. Snow Cone: Purified water, malic acid, citric acid, natural & artificial flavors, sucralose, sodium benzoate (preservative), FD&C Red No. 40, and FD&C Blue No. 1. Mixed Berry: Purified water, malic acid, citric acid, natural & artificial flavors, sucralose, sodium benzoate (preservative), and FD&C Blue No. 1. When should I take carnitine? How much carnitine do I need to take? Can I stack carnitine with other supplements?